My dog Griffey will soon be seven years old. As a black Labrador/Weimaraner mix, he is a deep black with a splash of white on his chest. In the last year or so, I’ve noticed that his muzzle is beginning to match the fur on his chest and that small grey hairs are starting to appear around his eyes. He also tires of fetch faster than he used to, seeming content to plop down on the grass, put his ears back, and take in the smells. I feel ambivalent about Griff getting old: I’m worried about saying goodbye, of course, but I’m also so glad that we’ve shared the last four years. And I’m looking forward to seeing his handsome, greying face beside me on many more walks. Like most of you, I want to be sure that my dog is as happy and healthy as he can be, as he ages. With that in mind, let’s take a look at some common signs of aging and possible solutions for issues faced by senior dogs. Some of the most obvious signs of aging are changes to the coat and skin. As I mentioned, greying fur, particularly on the muzzle and around the eyes, is common in older dogs. In some cases, along with graying, the coat may become dull or thin. Dry and itchy skin and small tumors, which are most often benign, are also fairly ordinary. Your vet can work with you to make changes to your dog’s diet that can help restore shine to her coat and heal damaged skin and can check to make sure that tumors are not cancerous. Activity level is another key indicator. You may notice that an aging dog can no longer bound up the stairs or doesn’t have the same verve for fetch. As with humans, reduced energy level and achy muscles and joints are common with age. Exercise is critical for maintaining an aging dog’s mobility and overall health, but be sure to allow your dog to take breaks and choose activities that are easy on joints and muscles. Supplements, such as glucosamine and chondroitin, massage, and orthopedic bedding can also be very beneficial. Limping or signs of significant pain should be checked by your vet, as these could indicate serious problems, such as back injuries, arthritis, or even cancer. Problems with the eyes, ears, and teeth often occur as dogs age. Nuclear sclerosis and cataracts both present as cloudiness in the eye. However, nuclear sclerosis often doesn’t cause difficulty with seeing, whereas cataracts do. Hearing loss, especially if mild, can be difficult to detect, but if your obedient dog begins disregarding commands, you might want to have her ears checked. Dental disease is a major problem for dogs of all ages, but is especially common with older dogs. Regular checkups and cleanings can help your dog maintain her beautiful smile and prevent more serious issues. Aging dogs may exhibit changes in behavior or temperament, become incontinent, or suffer problems with major organs, such as the heart or lungs. Such issues are the most distressing for dog owners. While behavior changes are sometimes merely the result of worsening vision or decreased hearing, they may also signal cognitive problems. It is best to consult with your veterinarian if your dog is showing any signs of these problems. Regular exercise, healthy diet and maintaining appropriate body weight, and regular checkups with a veterinarian are among the easiest ways to ensure that your dog’s golden years are happy and healthy. For example, after a recent consultation with Griffey’s vet, I made some changes to Griffey’s diet and exercise routine, to help him lose a couple of pounds. With prevention and a little luck, he and I will get to spend many more years together. If you want more information on specific ailments, treatment methods, nutrition, and other important senior dog issues, please visit the Senior Dog Care section of our blog. This is an informational article only. Please contact your veterinarian for advice. 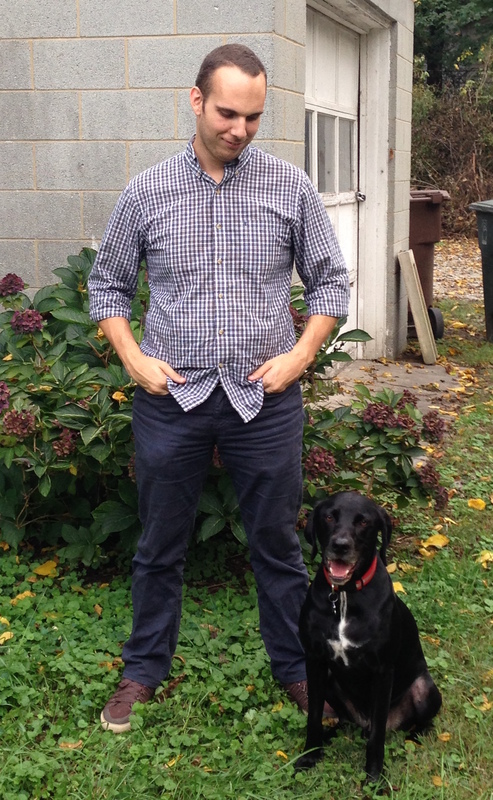 About the contributor: Andrew Jones is a lifelong dog lover. As the Grants Administrator for Family Service of the Piedmont, Inc., Andrew uses his research and writing skills to secure funding for programs that benefit victims of sexual assault and domestic violence. He lives in Greensboro, North Carolina, with his wife, Rebecca, and their two rescue dogs, Griffey (a regal senior) and Maybe (an incorrigible pup).